Food is good. We like food. Posted byGreg	 March 4, 2010 August 11, 2017 Leave a comment on Arepas! The final piece of the pabellón meal (that I am going to post here) is a piece that can actually stand on its own. Arepas are little cakes made of precooked, white corn flour that are usually cooked on a griddle in a little bit of oil, and then cut and filled with all sorts of good things. Sometimes it’s cheese, sometimes it’s meat, or vegetables, or a combination of any of those. 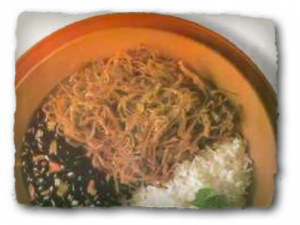 They come in all sizes, but for the pabellón meal, generally I make them about 2 1/2-3 inches in diameter. (If the arepa is the meal, they are generally 5 inches or so.) Also, they are formed to about 3/4″ thick. Once finished, allow to cool for a few minutes then slice open and add cheese (we use Queso De Freir, but most any white cheese will do) or whatever filling you’d like. Then enjoy! * There are several places to get the precooked white corn flour … here are a couple of good options: Harina P.A.N. (from AmigoFoods.com), or Goya’s (white) Masarepa . I am actually able to find both at our local Wegmans. Also, someday, I hope to visit the Caracas Arepa Bar in New York City. Check out their menu for some good ideas on what to put inside your arepas! Food @ GregsHead.net, Proudly powered by WordPress.